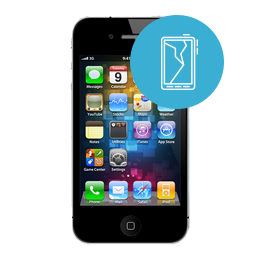 This iphone 4s glass and lcd replacement repair service will fix the broken glass and lcd on your iphone 4s. If your glass is cracked and your touch is not responsive or your screen is black and you cannot see but can hear text messages and/or calls this is the repair for you. All our repair services include a 90 day warranty on parts and labor. RockIT Repairs will fix and ship your device back out within 24 hours of receiving.